Kelly Poelker started her virtual assistant business part-time, while she was still working full-time. Within only 10 months, she was able to leave that full-time job and pursue her dream as an entrepreneur as President of her business, Another 8 Hours, Inc.
With over 20 years in retail sales, home party sales, mortgage lending, banking operations, and manufacturing, Kelly’s knowledge and expertise as a support specialist and virtual assistant has afforded her the ability to successfully support a variety of clients in a myriad of industries. An accomplished author, Kelly has written several books: bestseller Virtual Assistant – The Series: Become a Highly Successful, Sought After VA (Fourth edition) – (first and second editions, published as Up Close and Virtual: A Practical Guide to Starting Your Own Virtual Assistant Business); Virtual Assistant – The Series: Become a Highly Successful, Sought After VA Workbook Edition (1st edition, revised); Virtual Assistant – The Series: Working Virtually, A Guide to Working Remotely as an Employee; I Now Pronounce You Client… And Service Provider and Bizymoms Cookbook. Notably, Virtual Assistant – The Series is used as training material for VA courses and programs administered by numerous colleges and other higher level learning institutions. The book is the longest standing book in the industry, and is often referred to as the industry “Bible”. Kelly shares her broad knowledge and expertise in the virtual assistant industry as Director of the Academy of Virtual Professionals LLC, through social media, and as an industry speaker. She has also served on the Executive Board of International Virtual Assistants Association (IVAA) and is the co-founder of the first-ever annual VA Conference held from 2001 – 2006. 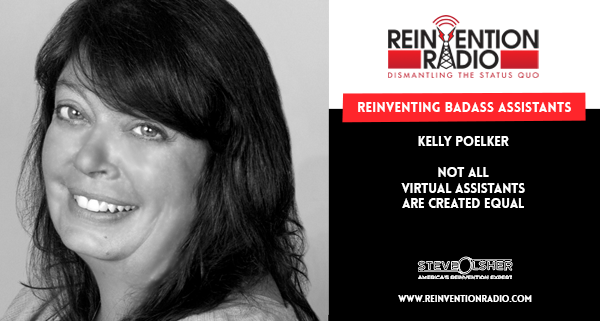 Kelly is also the Producer of the Reinvention Radio show. She manages the entire process from selecting and booking guests, editing audio, creating podcast version to all graphics and social media and more. TUNE IN to this episode as Kelly chats with Steve, Mary and Richard about what makes a badass assistant vs a virtual assistant and why not all virtual assistants are created equal. 3 – You don’t need to ‘train’ a VA; VAs work in collaboration; Diana Ennen of VirtualWordPublishing.com specializes in PR/Marketing; A VA ought to lead you through the process of identifying services; Contracts are a must! Reinventing Your Voice – In this episode, Per Bristow chats with Steve, Mary and Richard about how he empowers singers and speakers from around the world to heal, build and free their voices.